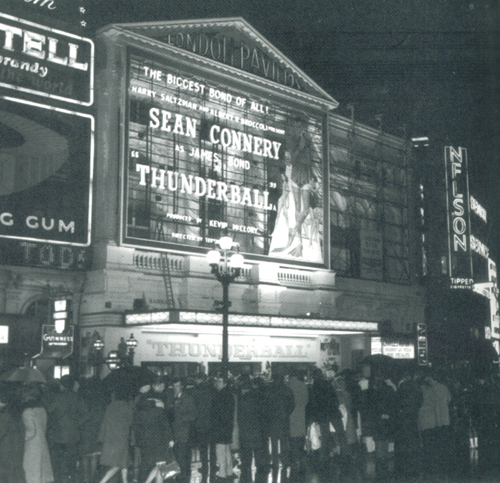 The UK film premiere of 'Thunderball' (the night of December 29th 1965) was such a big event that there was a 'dual premiere' - two locations were used. The London Pavilion Cinema, where 'Dr. No' had premiered in October 1962, hosted one and guests included Claudine Auger, Adolfo Celi, Luciana Paluzzi, Tania Mallet and Honor Blackman. 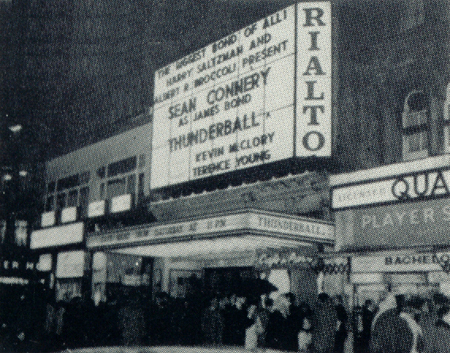 The Rialto Cinema hosted the other - guests included Guy Doleman, Molly Peters and Martine Beswick. The premiere party was held at the Royal Garden Hotel following the dual showings. [Both 'From Russia With Love' and 'Goldfinger' had premiered at the Odeon, Leicester Square and where, from 'You Only Live Twice', all future official Bond films have been first seen in the UK]. 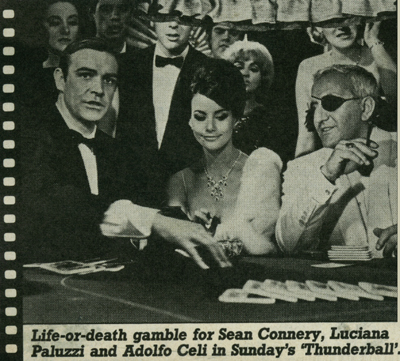 Both Sean Connery and Cubby Broccoli were not present for the premiere. Connery escaped the spotlight and stayed at home with wife and children; Broccoli was in New York - his mother had died two days earlier. January 1st 1966 saw Rank hold midnight matinees at all nine of its Premiere Showcase cinemas around London. 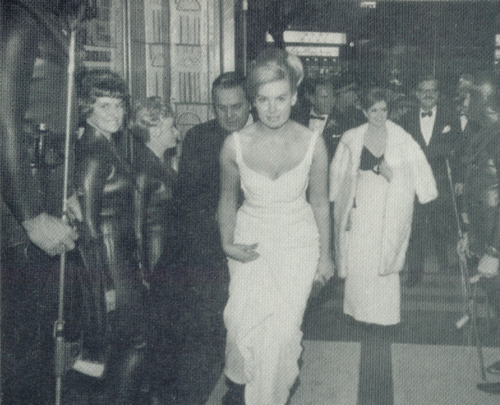 February 10th 1966 saw a charity premiere held at the Savoy in Dublin. 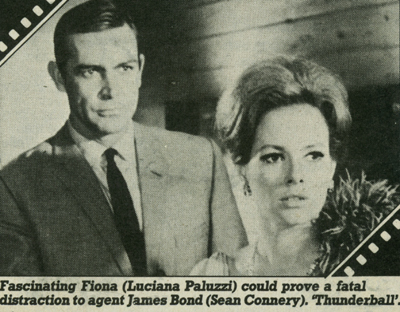 Luciana Paluzzi, Molly Peters, Kevin McClory and Cubby Broccoli were amongst the guests. This was followed by a party held by McClory at the Gresham Hotel. Screened on the ITV network - February 26th 1977. 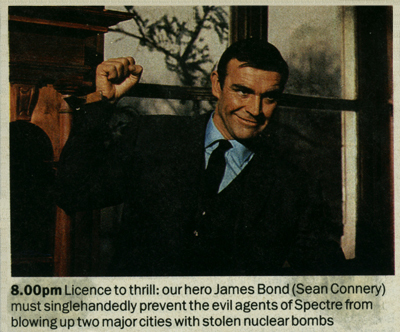 ITV had bought the TV rights to the first six James Bond films for £850,000. Screened at the Manhattan Paramount Theater in New York - December 21st 1965. The pilot of the Bell Textron jet pack was arrested after a stunt where he jetted off the top of the cinema - he did not have a suitable permit. 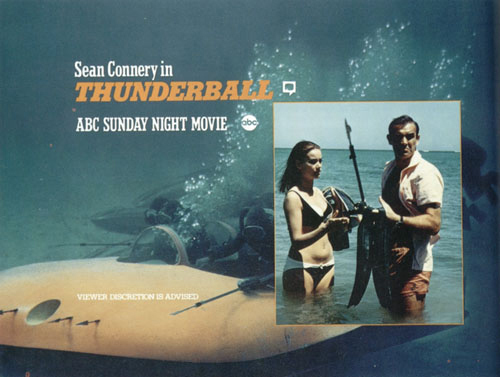 "For the first time on television - Thunderball. James Bond is agent 007. Bond takes his work very seriously. 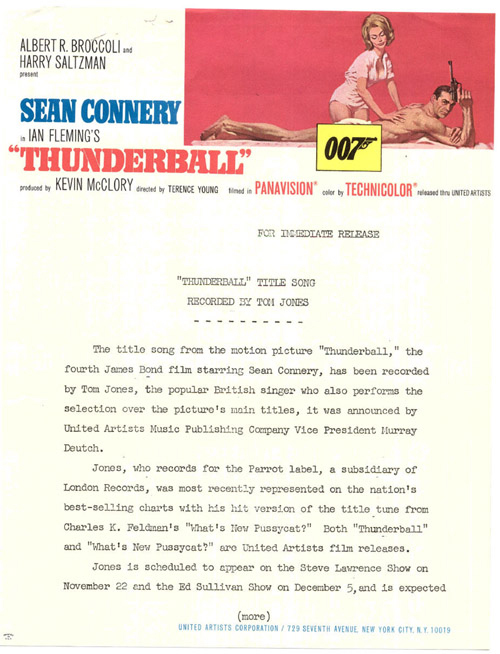 Sean Connery is James Bond, 007 is back in Thunderball." Screened on ABC - September 22nd 1974. 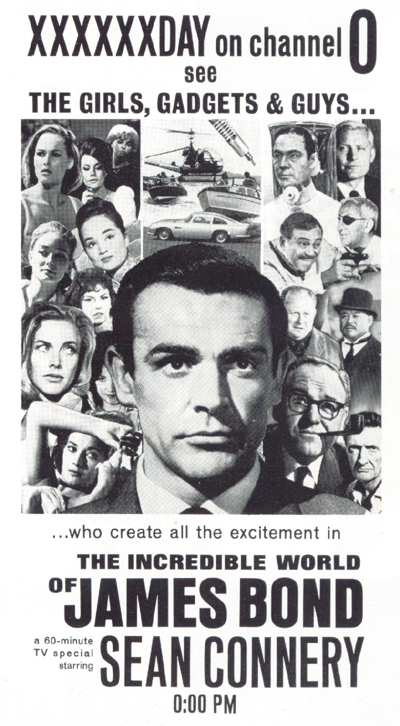 United Artists had sold the broadcast rights for the series to ABC in 1972 - 'Goldfinger' was the first film screened. Screened on NBC - November 26th 1965. 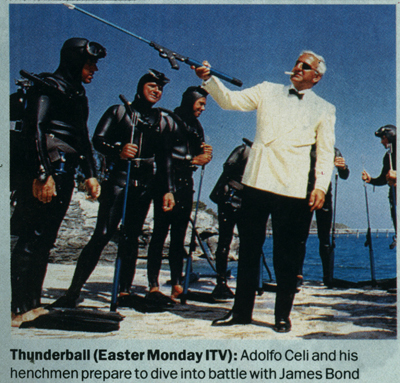 One hour long special - including footage of Fleming at Goldeneye; film of Claudine Auger, Luciana Paluzzi and Martine Beswick posing for the press; behind the scenes footage of the filming at Silverstone aswell as footage of the onboard fight on the Disco Volante from the film's climax. Produced and directed by Jack Haley Jr. / narrated by Alexander Scourby / A David L. Wolper Production. Excerpts also used from 'Dr. No', 'From Russia With Love' and 'Goldfinger'. Leslie Bricusse was hired to write lyrics early on in production of the film. The title song was to be 'Mr. Kiss Kiss Bang Bang' - which is what Bond had become known as in both Italy and Japan. John Barry and Bricusse wrote the theme and Barry then scored the film around the song which was originally recorded by Shirley Bassey, later by Dionne Warwick. John Barry - "Dionne's was a marvellous song and she did a great arrangement for it. It was a really strange song. I had about twelve cow bells on it with different rhythms, along with a large orchestra, and thought it a very original piece. Then, at the last minute, they got cold feet and decided to have a song called 'Thunderball'." 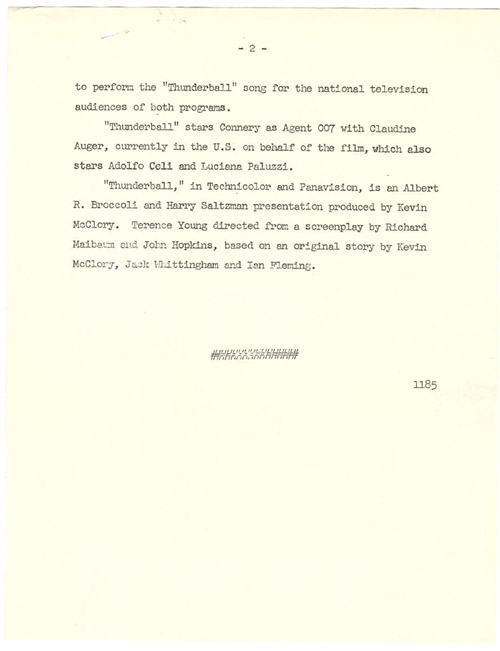 A last minute decision by the producers to change the theme to 'Thunderball' meant a new song had to be written. With Bricusse working on another project, Don Black was brought in to write the new theme with John Barry. Tom Jones sung the new title theme, reportedly passing out after hitting the final note of the song. The soundtrack was compiled before John Barry could complete the film's scoring and so most of the tracks featured on the original LP were from only the first half of the film. 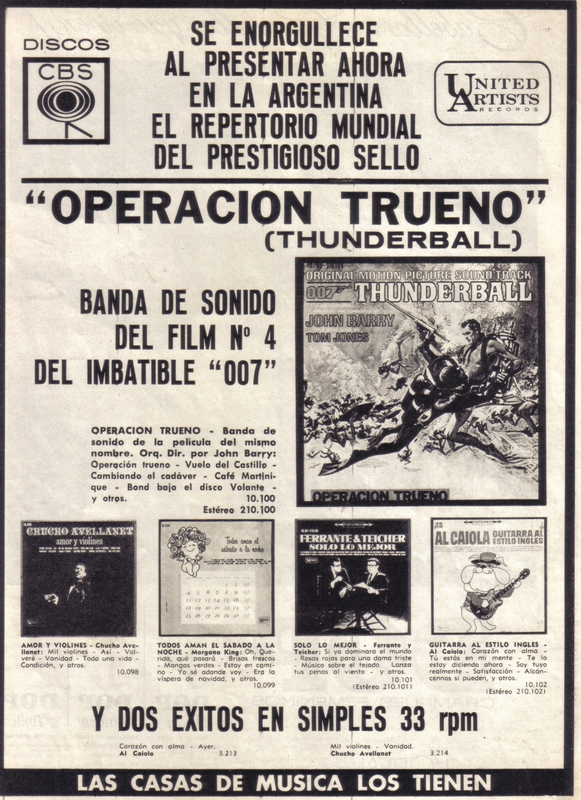 The theme song 'Thunderball' reached number 35 in the UK singles chart (entering the chart on January 13th 1966) and number 25 in the US Billboard singles chart (entering on December 11th 1965). The soundtrack album reached number 10 in the US Billboard albums chart (entering the chart on December 11th 1965). 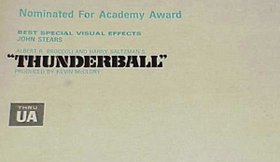 So he strikes, like Thunderball"
John Stears won an Oscar (Academy of Motion Picture Arts and Sciences award) in 1966 (April 18th) in the category 'Best Effects - Special Visual Effects' for 'Thunderball' - the second and final Oscar to date awarded to the Bond series. (Also nominated was J. McMillan Johnson for 'The Greatest Story Ever Told'). 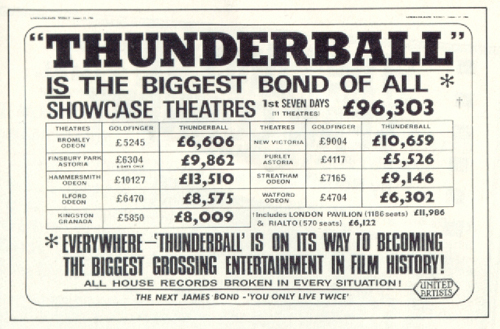 Ken Adam was nominated for a BAFTA award also in 1966 in the category 'Best British Art Direction (Colour)' for 'Thunderball'. Richard Maibaum was nominated for an 'Edgar' at the Edgar Allan Poe awards in 1966 in the category 'Best Foreign Film' for 'Thunderball'.